Thomas Moscibroda is a Partner Research Scientist in Microsoft Azure. Before joining Azure in September 2017, he managed the Cloud & Mobile (C&M) Research Group at Microsoft Research Asia. He is also the Chair Professor for Network Science at the Institute for Interdisciplinary Information Sciences (IIIS) at Tsinghua University. 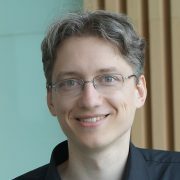 Before moving to China in 2011, Thomas was a member of the Systems Research group at Microsoft Research in Redmond, and an affiliate member of the Networking Research and Computer Architecture Research groups, respectively. He obtained his PhD in 2006 from ETH Zurich in Switzerland, and was awarded the ETH Medal for his doctoral thesis. Thomas is the overall architect for capacity and efficiency in Azure Compute. He has been working on cloud resource management technologies, many of which have become core infrastructure components in Microsoft Azure data centers. Thomas’ academic research interests are in cloud computing, distributed systems, networking, and most recently blockchain technology. He has a particular focus on algorithmic and mathematical approache to practical system problems. His research is documented in more than 100 internationally peer-reviewed research papers and has led to more than 50 patents. His work on the foundations of distributed systems and computing, and on white-space networking have received Best Paper Awards from several prestigious academic publication venues, including ACM SIGCOMM 2009, USENIX NSDI 2009, ACM ASPLOS 2010, EuroSys 2012, ACM/IEEE IPSN 2007 and 2017, ACM PODC 2004 and 2012, as well as DISC 2015. His articles on DRAM scheduling and on-chip networking in multi-core systems were selected as IEEE Micro Top-Pick Computer Architecture papers in 2008 and 2010, respectively. Thomas is also the recipient of the MICS Research on Communications Award by the National Research Foundation of Switzerland (NCCR) for his contributions to the area of Mobile Communications & Information Systems. Thomas has served on numerous technical program committees, including for SOSP (2017), OSDI (2016), NSDI (2016), PODC (2009, 2010, 2015), MOBICOM (6 times), EuroSys (2015), ICALP (2013, 2016), and IPSN (2012, 2013). Joined Microsoft Azure as a Partner Research Scientist in September 2017. My role is to lead capacity and efficiency-related efforts in Azure Compute. Our paper Density-Aware Compressive CrowdSensing was awarded the ACM/IEEE IPSN 2017 Best Paper Award. I gave a Keynote Speech on Technologies behind the FinTech Revolution: Cloud, Big Data & AI, and BlockChain at the Global FinTech Summit in Xiamen, China, 2017. Started our new Cloud & Mobile (C&M) Research Group at MSR Asia. The group consists of researchers and engineers from three former teams at MSRA: Wireless & Networking, System Algorithms (SysAlgo), and Mobile and Sensing Systems (MASS) Research Groups. Having researchers from all these groups closely work together is exciting. Let’s get going on even bigger and grander ideas…! Our paper Local Information in Influence Networks was awarded the DISC 2015 Best Student Paper Award. I gave a Keynote Talk on System Algorithms for the Cloud and Big Data at the 29th International Symposium on Distributed Computing (DISC) in Tokyo, Japan. My first two PhD students graduated from IIIS Institute at Tsinghua University. Congratulations to Dr. Xiaohong Hao and Dr. Liwen Xu ! I gave a Keynote Talk on Incentive Networks at the 42nd International Colloquium on Automata, Languages, and Programming (ICALP 2015). Received the MICS Research on Communications Award by the National Research Foundation of Switzerland (NCCR) for contributions to the area of Mobile Communications & Information Systems (MICS) during the past 10 years. Our paper On the Price of Equivocation in Byzantine Agreement was awarded the PODC 2012 Best Student Paper Award. Was awarded the EuroSys 2012 Best Paper Award for the paper MadLINQ: Large-Scale Distributed Matrix Computation for the Cloud. Was appointed as the Chair Professor for Network Science at the Institute for Interdisciplinary Information Sciences (IIIS) at Tsinghua University. We are hiring! Both Azure Compute and Microsoft Research Asia are hiring! If you are interested in working with me and our team on cutting-edge research and cloud computing, please send me an email. Full-Utilization Data-Center: Hyperscale public cloud providers such as Microsoft invest billions of dollars into their cloud infrastructure. It is therefore critically important that the provisioned resources are as efficiently used as possible. For the past several years, we have been working closely with core Azure infrastructure teams to design state-of-the-art resource utilization technologies, including allocation and scheduling algorithms that maximize the utilization in our data centers. Numerous of our solutions are now in worldwide production across our Azure datacenters. Intelligent Blockchain: Blockchain is an emerging technology with the potential to change the way businesses, industries, and public organizations conduct and verify transactions, thereby streamlining business processes, saving money, and reducing the potential for fraud. In our Blockchain project, we are currently working to design new innovative Blockchain (particularly Blockchain-as-a-Service (BaaS)) applications, to make blockchain more efficient, and to gain fundamental novel insight into Blockchain networks. Data Center Networking: Data center networks hold a pivotal role in cloud computing, as it interconnects all of the data center resources. DCNs need to be scalable and efficient, connecting hundreds of thousands of servers to handle the growing data requirements of big data applications, and low-latency demands on online services. We work closely with Azure Networking on state-of-the-art (software-defined) networking technologies that power Microsoft’s data center networks. FPGA-Accelerated Networking: Building network infrastructure for mega scale data centers and ever increasing data transfer rates requires fundamental shifts in networking technology. In this project, we are working on using FPGA-based smart network cards (NIC) and other hardware-based acceleration techniques to achieve unprecedented accelerated network performance. Graph Computation & NoSQL: We are working on a highly efficient middle layer that can enhance any existing data storage system (SQL Server, Oracle, Azure DocumentDB) with graph processing capabilities. The underlying principle behind our work is a novel “NoSQL on SQL” approach – we believe (and prove!) that contrary to popular believe, a vast majority of NoSQL workloads can be highly efficiently managed and processed on top of existing data stores. Next-Generation, Storage-Class Memory Systems: Emerging non-volatile memory (NVM) hardware is changing the landscape of data storage. Traditional dichotomy between fast volatile memory and slow persistent disks is shifting towards a unified memory-level persistent storage layer, which largely unlocks the performance potential of many applications. To that end, we revisit and innovate on many aspects of the traditional architecture and system stack, spanning processor/memory controller design, operating system/software framework and programming techniques. FollowUs — Infrastructure-Free Plug-and-Play Indoor Navigation: There has been a proliferation of research work on indoor positioning in previous years. In this project, we take a different and novel approach. Focusing on the more constrained problem of navigation, and using the unique properties of the geo-magnetic field, we are building an easy-to-deploy completely infrastructure-free, plug-and-play indoor navigation system. Public Bicycle Sharing: Public bike-sharing systems have emerged as a new innovative mobility strategy, and are now common-place in many big cities worldwide. In our project, we are collaborating closely with the world’s largest public bike-sharing operator, building spatio-temporal mobility models, traffic predictions and state-of-the-art bike rebalancing algorithms to optimize the system’s efficiency and customer-satisfaction.